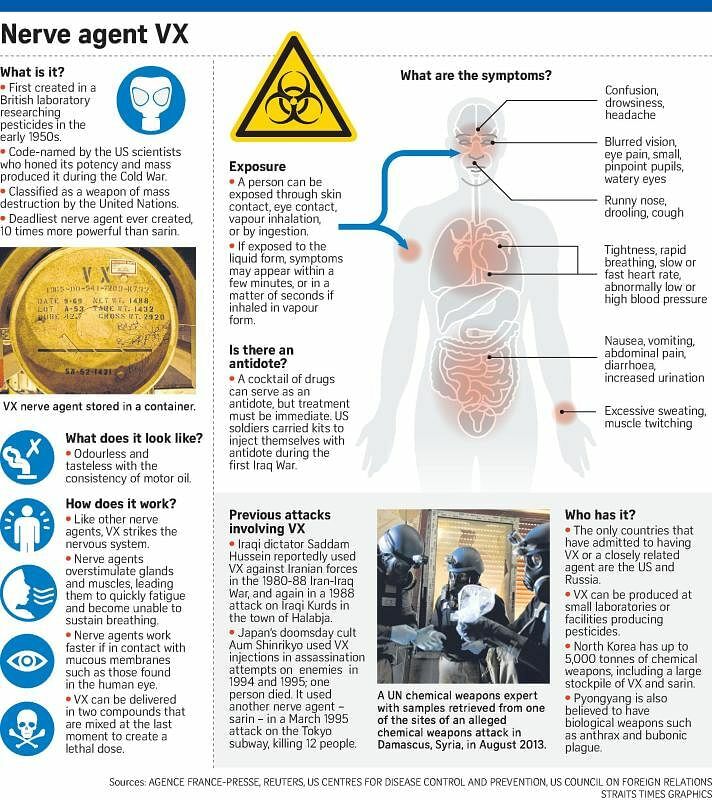 SHAH ALAM, SELANGOR - Mr Kim Jong Nam, the estranged half-brother of North Korea's leader Kim Jong Un, had abnormally small pupils, excessive sweating and other symptoms of nerve gas VX poisoning, a court here heard on Tuesday (Oct 3). A doctor at an airport clinic where Kim Jong Nam received treatment on Feb 13 said the victim had "constricted pinpoint pupils". When asked by the prosecution if the abnormally small pupils were caused by poison, Dr Nik Mohd Adzrul Ariff Raja Azlan said: "Yes". The doctor was the fourth witness called to the stand for the closely-watched trial of the Kim Jong Nam's murder at the Kuala Lumpur International Airport (KLIA) earlier this year. Two women charged with his murder - Siti Aisyah, 25, from Indonesia, and Doan Thi Huong, 28, from Vietnam - pleaded not guilty at the start of the trial on Monday (Oct 2). Chemical pathologist Nur Asyikin Osman from Hospital Kuala Lumpur was also called to the stand on Tuesday. After Kim Jong Nam was sent to the hospital from the clinic, she conducted an enzyme test that would indicate presence of muscle contraction. Results showed that the levels of enzyme cholinesterase was low for Kim Jong Nam, a sign that he could have been poisoned by insecticide or nerve agent, she told the court. VX can affect the lung and heart muscles, disrupt the functions of secretion (saliva) and sweat glands, and cause the constriction of the pupils, she told the court. First synthesised in 1952 by a British chemist researching pesticides, VX is one of the most lethal substances on Earth. Under the effect of the VX poison, the victim's muscles will clench uncontrollably and, eventually, prevents him or her from being able to breathe. The court also heard that atropine, which was described as an antidote for VX poisoning, was given to Kim Jong Nam at the clinic at the airport. But the dosage - 1mg - was not effective, prosecutor Wan Shaharuddin Wan Ladin told reporters. Kim Jong Nam died an hour after he was allegedly poisoned at Terminal 2 of KLIA. Earlier in the morning session, the court heard that Kim Jong Nam had a mixture of saliva, blood and vomit in his mouth when he arrived at the airport clinic. Dr Nik Mohd Adzrul Ariff Raja Azlan said the 45-year old had very low blood pressure and very low oxygen levels when he arrived at the clinic. The doctor was also unable to detect a pulse on him. Apart from atropine, adrenaline was also given to Kim Jong Nam to increase the heart rate, the court heard. When the non-invasive procedures did not work, the clinic doctor tried to carry out intubation. He recalled that when he tried to insert the tube into the trachea, the smell from the victim's mouth was "difficult". There was a mixture of saliva, blood and vomit in Kim Jong Nam's mouth, the doctor said, adding that he had to perform suction before carrying out intubation. Medical assistant at the Menara clinic Rabiatul Adawiyah Mohd Sofi, who was called to the stand on Monday, said Mr Kim appeared to be in pain and was not responsive to questions when he arrived at the clinic. She said his eyes were bloodshot and that he was sweating profusely. A total of 153 witnesses will be called during the trial, which is closely followed by both local and international media.